Shin splints are often the cause of the pain you feel on the front of your lower legs below your knees. Shin splints occur through overuse of the muscles in the shin and the pain is caused by small tears in the muscles and along the bone. Shin splints are a common injury caused by walking a lot and sports that involve a lot of running. Your leg may feel tender and there may be mild swelling. Shin splints will typically heal on its own by following rest, ice, compression and elevation along with some OTC pain relievers to help with the inflamed tissues. 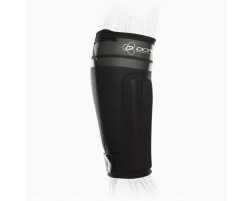 Wearing a shin splint brace or sleeve that helps apply compression often helps with relieving the pain and the healing process.